Browse > Home / Ask Dr. Vicki, Parenting, Teenagers/Tweens / Should Children Remember to Brush Their Teeth? 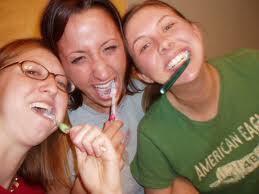 Group toothbrushing? Well, teenagers do like doing things in groups! When do kids start brushing their teeth without reminders?? This is a very common parenting question…which should tell you something. There are some things that it seems many children needs reminders way into their teens. Here are my top 5 grooming reminders: Brush teeth; brush hair; take a shower/bath and wash hair; change clothes (especially underwear) and wash hands. For some reason, many of these common, routines and even daily events just don’t seem to form memory paths into their brains until some children are well into their teens. At some point, tweens and teens begin to be very aware of their appearance and begin to overly groom. Then, you are yelling at them about their showers being too long and wasting hot water, their taking an inordinate amount of time to get ready in the morning, the expense of all the grooming products they just have to have and the amount of laundry that breeds on their bedroom floors. So—be careful what you wish for! In the meantime, instead of having to be their vocal reminder every day, you may want to put up a list of morning and evening responsibilities that they need to do. That way, instead of being the inquisitor, you can remind them to check their list and be sure they get it all done. You may even want to put the list in the bathroom, so they are bound to see it at some point in the morning and night. Getting a preferred flavor of toothpaste, the shampoo they like, and so on, can help. Also, negotiating when they would prefer to shower, how often they think they need to wash their hair, how many days jeans can be worn without washing, etc. can give your kids some control in their grooming choices. Rewards can even be given for taking on their responsibilities without having to be reminded. What about you? Do you have to remind your kids to do simple things? Please feel free to leave a comment below. Thanks for this article, I don’t know how many times I have to constantly remind my oldest on her groomin. (8yrs old) I was starting to belive that she just didnt care at all, now I know its an age developmental milestone. There are many ways to remind a child to do something. One way, is simply to tell her…”Go brush your teeth!” Or, you can cue her by saying, “What do you need to do after you eat?” That way, you are encouraging her to self-evaluate and begin to take the reminder on for herself. One other idea is to have a daily check list with the tasks that need to be done, with brushing teeth being one of them. That way, you could say, “Did you check your list?” which again is one step removed from you actually reminding her to do a specific task. Thanks for writing in! Enjoy your kids! There are some things that it seems many children needs reminders way into their teens. Here are my top 5 grooming reminders: Brush teeth; brush hair; take a shower/bath and wash hair; change clothes (especially underwear) and wash hands….